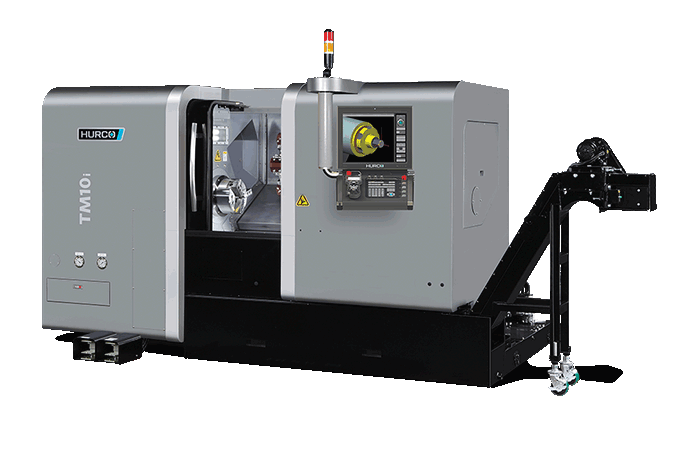 The small footprint, large work cube, chip management system, and affordable price tag of our slant-bed CNC lathes in the TM Series make small batch manufacturing profitable. A true slant-bed CNC lathe with small footprint and large work envelope. Straightforward control software that simplifies turning from start to finish. When it comes to building rigid and reliable machine tools, experience matters. With the Hurco TM, an Ohio shop saved 33 hours on one job. 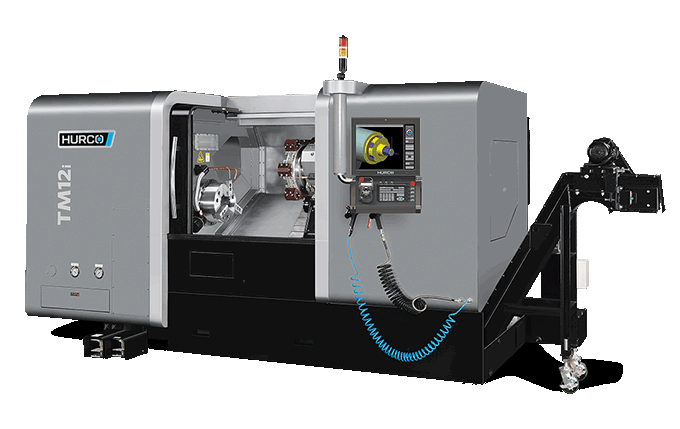 The feature package of the TM CNC lathes make them the best value in the industry. Parts catcher, tool pre-setter, chip conveyor, bar feeder, and more. 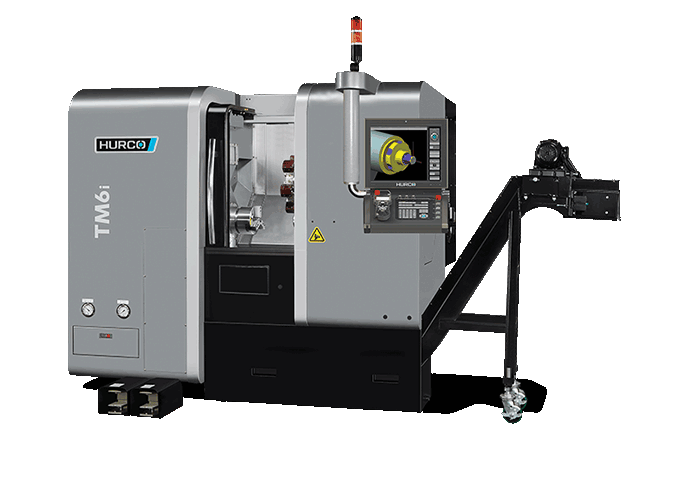 The TM turning centers are designed for general purpose turning applications and provide an easy transition from manual turning or milling. Design + Construction: We use thick-walled, fine-grain cast iron for the major structural assemblies (base, head stock, and cross slide). The rigid one-piece machine base casting is designed to yield excellent static and dynamic performance in addition to outstanding dampening properties that inhibit thermal deformation and twisting. The box type cross slide ensures the turret remains rigid and stable even during the most rigorous cycles. We also use extra wide linear guide ways that are strategically spaced to provide excellent support to the cross slide. Hydraulic Turret: The slotted tool turret is designed to provide fast and accurate tool indexes. You can use any combination of ID and OD tool holders. The turret uses a large cervic coupling for accurate location and clamping. Machining Capacity: The generous turning diameter and turning length allows a wide range of part sizes and applications. At the heart of the TM slant-bed lathes is the power and flexibility of the integrated Hurco control powered by WinMax®. The control can be programmed on the shop floor with Hurco's patented conversational programming or industry standard NC. Our control lets you choose the best method of programming for your shop and for each individual job. No other control offers the level of flexibility that you will experience with the Hurco control. Additionally, the easy to use touch screen provides helpful setup and verification graphics that show cuts on the screen before they are executed--virtually eliminating wasted materials and potential machine crashes. DXF Transfer: Eliminates the need to hand code complex profiles. 3D Verification Graphics: Half and quarter views with semi-transparency to see more of the toolpath information especially inside the part. Auto Tool Nose Radius Compensation: Eliminate the need to use trigonometry to compensate for the tool nose radius on start and end positions of a toolpath. Conversational Programming: Our founder invented this intuitive, straightforward programming method that leverages the power of technology to do what software does best—the redundant and mathematical tasks—and leaves the machining expertise to you. Features such as AutoCalc, Constant Surface Speed, and Diameter or Radius Programming, are just a few examples of how conversational simplifies complex processes. ISNC (G Code) Programming: While we're known for our conversational programming, the NC side of our control accepts FANUC formatted programs, including macros, and is compatible with the most utilized CAM systems. Compared to the years we have been developing control technology and machining centers, our nearly decade long lathe experience may seem short. However, we've leveraged our overall machine tool experience and efficient process approach to ensure that each decision we make meets our objective to deliver manufacturing technology that helps our customers increase profitability. We know that premium components and expert design are critical in machine tool development. Therefore, you will have the peace of mind that your TM lathe will be reliable and rigid. 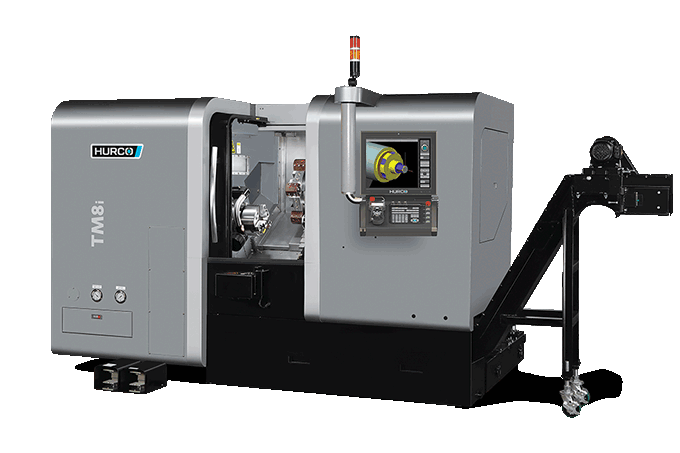 Learn more about the features that make the TM lathes the best choice for general purpose turning. Mark Lanese, owner of Lanese Quality Tool, was able to pick up the conversational programming on his Hurco TM8, the first day. He describes how he saved nearly five days with the Hurco TM8. "The Hurco CNC cell, a VM1 VMC and TM8 CNC slant-bed turning center, is a vital part of their Lindsay’s business today and in the future." Our control technology is the greatest advantage of our lathes because the technology we develop yields the greatest opportunity for our customers to increase profitability via increased productivity. With large capacity memory, a fast processor, and multiple control features that minimize setup time, you will benefit from a control that helps you get from print to part faster. Spindle Motor and Drive: The spindles on the Hurco TM Series of slant-bed CNC lathes utilize poly-V belts, which are ideal for turning. The spindle speed ranges have been engineered for the best metal removal rate for a given chuck size, up to 6,000 rpm. We use precision steel bearings packed with lifetime grease, which results in a maintenance-free lubrication. The brushless, AC motor drives the spindle and delivers impressive power and torque. Guide ways: The guide mechanism for the axes is fitted with precision linear ball rails. Our linear rails are built with the same precision grinding technology used in the manufacture of bearings because this technology provides superior acceleration and deceleration performance at full load-carrying capacity in all directions. Using Finite Element Analysis (FEA) technology, the size and spacing of the linear ball rails have been carefully matched to the machine’s static (precision boring) and dynamic (cutting and traversing) operating requirements. Each bearing block is independently and automatically lubricated to promote long life. Ball Screws: For feed drive elements, Hurco only uses premium, quality designed, pre-tensioned ball screws. With up to 98% efficiency, the re-circulating ball nut ensures low friction power transmission from the screw to the slide. This guarantees the combination of high accuracy, high rapid traverse rates, and high feed thrust. Large diameter X-axis and Z-axis double nut ball screws are hardened and ground, centered between the guide ways, and anchored at both ends with pre-loaded ABEC-7 precision class angular contact thrust bearings. This combination prevents backlash and provides outstanding positioning repeatability with virtually no thermal growth. Axis Drives: To maintain a leading edge in motion control technology all ball screws are driven by Yaskawa or Rexroth servo systems with closed-loop adaptive tuning and high-resolution feedback to obtain the utmost in system performance and reliability. The AC servo motors are direct-coupled to the ball screws for the highest level of accuracy. The brushless AC servo drive motors provide high torque to inertia ratio for the axis drives. The X and Z axis motors deliver impressive torque for peak thrust during heavy cuts. High Pressure Coolant: Provides upto 1000psi for deep hole drilling. Lift-Up Chip Conveyor: Increases productivity by keeping the spindle cutting, while chips are carried out of the machine with a barrel height chip conveyor. Easy front access is provided. Auto Tool Presetter: This Tool Touch Probing package is a compact and robust tool setting probe, which utilizes a stylus touch application for accurate measurement of tool geometry offsets. Tool probing is for initial tool set only and will not support automatic in process gauging. Tail Stock: The heavy duty, programmable tail stock ways are hardened and ground with precise alignment for accurate center positioning. You can activate the quill with a footswitch or from the control with an M function. Parts Catcher: Air operated swing plate type parts catcher. Parts are transferred to an enclosed bin mounted outside the sliding access door. The kit includes an air pressure regulator, dryer, and lubricator. Hurco Bar Feeder: This magazine-fed automatic bar feeder increases productivity. The Integrated PLC controller comes with a remote control pendant for fast and easy setups and includes three (3) pusher rods. The Hurco bar feeder comes standard with a slider assembly for easy door access. Bar Feeder Interface: Allows third-party bar feeders to be controlled by Hurco lathes. Oil Skimmer: Increases coolant life and performance by removing unwanted oil. Mist Collector: Provides a safe, clean environment while also reclaiming evaporated coolant mist. Hurco has been advancing the manufacturing industry for 50 years. From the first computer controlled back gauge in 1969 to our patented UltiMotion system, we are dedicated to technology innovation that makes manufacturing more efficient and manufacturing companies more profitable.